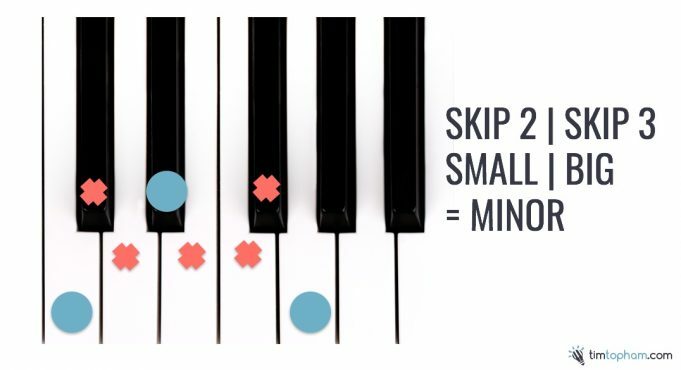 Ever wondered the simplest way to teach piano chords? 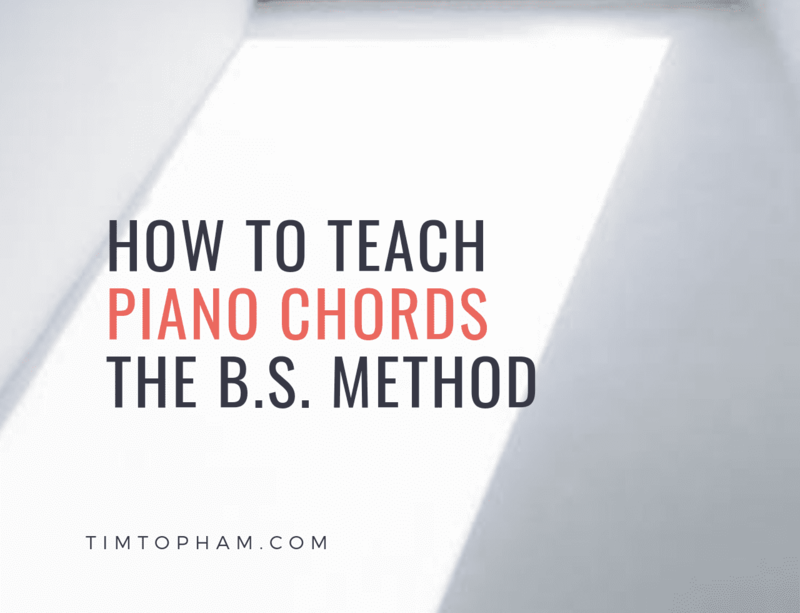 If you’d said to me a month ago that talking “BS” in my studio was a good way of helping kids play chords, I would have been shocked to say the least! Now, having used this technique on a number of students, its value is unsurpassed in time-saving. A colleague recently explained to me a brilliantly simple method of helping students play major and minor triads. Many of you may well already use this method, but I thought I’d share it with everyone in the hope that it helps other piano teachers who are just developing their pedagogy. It involves students realising the size of the interval between the three notes of a tonic triad. Take the F major triad: FAC. If you count the number of notes you are skipped between the first two notes, F and A, you’ll count 3 (F#, G, G#). If you count the notes skipped between the top two notes, A and C, you’ll count just 2 (A# and B). This difference is the key to understanding the construction of major and minor triads. Given the interval between the lower two notes of the F major triad is 3 notes skipped, it is called the BIG gap. 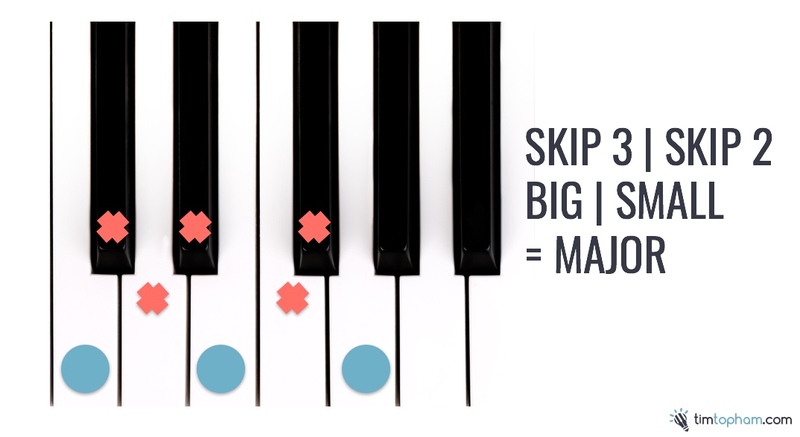 The top two notes only skip 2 notes, so that’s the SMALL gap, hence it’s a BIG-SMALL chord or “B.S.” for short! Now take the minor triad F – Ab – C. You’ll now notice that the sizes of the intervals has reversed with the small interval now at the bottom (F – Ab) and the big interval at the top (Ab – C), hence a minor triad is a SMALL-BIG chord. This is easy to remember because another word for “minor” is “small”. How cool is that? So without any further instruction, a student should be able to form a major (BS) or minor (SB) chord on any note of the scale! Try it with your students today. I start my beginners on triads right from their first couple of lessons. I like to start my piano lessons with some creative ideas. It allows me to avoid the awkward, ‘So did you practice?’ question, and catches students off guard – in a good way! One way to do this is by giving my students some easy chord progressions to play through. I have come up with 27 fun and easy chord progressions, not based off any real pieces. These are just chord progressions I think are good for students of any level. You can start with the easier and shorter progressions, and work your way through to the harder ones. From there, you can work on improvisation, melodies, different styles and so forth. Make sure you grab your free download! Just put your details in below and inspire your students with a creative lesson starter. Don’t forget to check out my 4 Chord Composing course for more help on chordal teaching. Enjoy!